1. 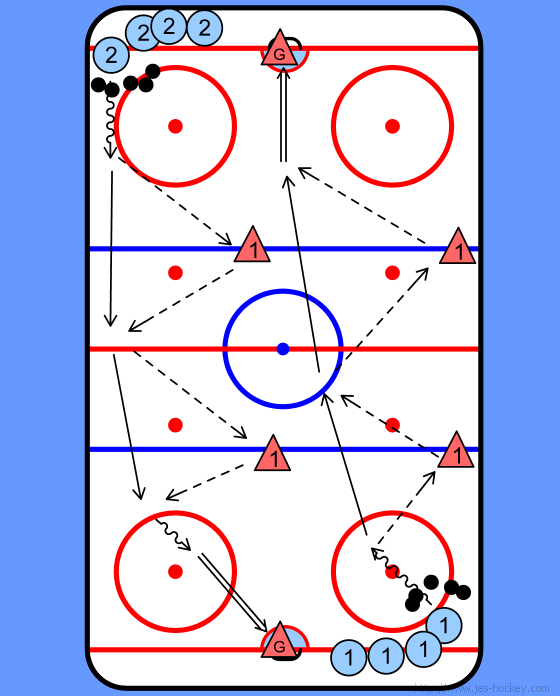 Players 1 and 2 start by making a pass to the red 1's who then skate up the ice and have their pass returned. Repeat with the second red 1. It must be stressed to the players to move away from the puck. Also the passers should hit the stick of the receiver not float a pass in their direction. Basically nice crisp passing and use all of the ice. Good warm-up drill for a team that is starting to work on the breakout. Gets the players going through the motion of moving the puck up the ice.